What Actualy is a Retreat, and Why Go? Blog What Actualy is a Retreat, and Why Go? What Actually is a Retreat? As a person who has practiced silent teacher-led meditation retreats for decades and led them for about 14 years, I’ve been reflecting on this question a lot, trying to see it through “fresh eyes” and with a “beginner’s mind”. With all this experience and great mentors to draw from, I thought I would share some of my evolving thoughts and feelings about what a retreat should or could look like, in the hope that these things might interest or inspire people to participate in a retreat. I’ve practiced mainly in the Soto Zen tradition where a retreat looks like many hours of sitting Zazen (Zen meditation) on a cushion, with an emphasis on stillness, broken by walking meditation, and meals in silence. There are opportunities to meet with the teacher, to discuss how one’s practice is going, and a Dharma talk each day. Meditation retreats traditionally also include a period of working meditation to keep the center going and to offer an opportunity for participants to see that practice, as my primary teacher says, “doesn’t have to look like any one thing”. Personally, I love these periods of working in silence alongside other practitioners. Over the years I have dug trenches with a Japanese Buddhist priest and an English school teacher. I’ve hung drywall with my teacher and a business owner from Brazil, chopped endless onions with a priest from Holland…and cleaned toilets, scrubbed floors, and pulled weeds by myself. One of the hardest laughs I have ever had was in the kitchen chopping red bell peppers with a friend. The head cook was grouchy and under pressure, as she was cooking for some foreign Zen dignitaries. For some reason (like laughing in church) my friend and I got an intense case of the giggles over our poorly chopped vegetables, and the more we tried to stop, the worse it got, until everyone in the kitchen was laughing. This is one of my most cherished moments on retreat as much as all the tears I have shed and insights I have had, laughing is good practice for sure! Regarding my attitude towards work practice, I feel that because we have been meditating formally for hours, since early morning, those hours inform my work practice, and give me a chance to see that I can take this present moment concentrated mind anywhere. And when I do, I enjoy it so much more – even cleaning bathrooms! And it shows me the possibility that I can practice anywhere, doing anything, it’s all a matter of how and where my mind is. This all means I am a lot more likely to take the practice home with me into what we call ’regular life’, which is, of course, our life too! The dictionary says that in its verb form “retreat means: “To move back and away from something or some one because you are frightened or want to be alone”, or in military contexts means you are ceasing to fight. As a noun it means “A private safe place where you can be alone.” None of these capture my experience of a meditation retreat, and I so appreciate that my teacher says it shouldn’t even be called retreat! He says it should be called “approach”. On one level we have moved away from work, family, hobbies, routines, and these days, from electronic devices and even reading. But on another level we are moving toward something: ourselves and the direct experience of being alive. We are allowing the world in more not less. When there is a minimum of external input we can really see that water spider in the stream like it is the most miraculous thing in the world. We taste the simple food. We connect with ourselves, and in the silence, as we practice, eat and work together, with the community of “spiritual friends” even though they might seem like strangers. So 14 years ago, when I decided to begin to offer retreats, I wondered what would happen if we combined some periods of formal meditation and silence with other activities, like art, writing and a music workshop, in the same spirit of work practice. What I heard in the closing circle was that people so appreciated seeing and feeling the many doorways to the present moment and they were able to really play and have fun, in a new way, similar to work practice, because these activities happened after several hours of formal meditation and silence. The practices set us up to be truly present for joy or to take a risk and pick up a drum or try to draw or write a poem, even thought we thought we couldn’t. And as people came back year after year, they told me many stories of how these particular retreats gave them a way in to practice and transformed their lives in ways I could not have imagined when I cooked up the idea. Seeing so many grownups reclaim their child-like joy, their ability to play and to wonder, gave me joy and the feeling that this type of retreat had great value too. So for fourteen years we’ve been offering these every summer, and people keep coming back with great gratitude and joy, and because it is a safe place to feel all their feelings and find a variety of ways to hold them, express them, and be held, by the teachers, the group, themselves and the great natural world itself. So with great excitement, my friend and colleague Steve Hickman and I wish to invite you to a retreat in this same spirit, offered in the wondrous land of Bali where we will indeed practice formal mindfulness meditation, and yoga and get to play and create, sing, dance, and feel as fully alive as possible. Please join us, you may enter the present moment through any doorway if your heart is willing. 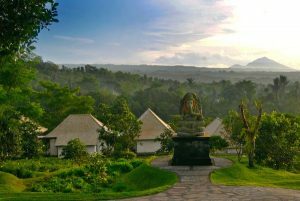 For more information, visit our website and consider joining us in amazing Bali for five days of glorious retreat.